Pretty much media files stored on your Windows & Mac? How do you get your computer video library when you're away? Have you ever wished you could enjoy the music and videos stored on your computer while you're out? Now a brand new way is coming out, it is the time to forget about copying all your media from your computer to portable devices for watching and sharing. About a week ago I came across a product called Air Playit which provides an innovatory way of streaming video to iPhone iPad through remote access via internet. It is a multifunctional yet free video streaming software to stream video & audio libraries to your iPhone, iPad and iPod Touch via remote WiFi and 3G/4G network. Without the need of video conversion, Air Playit can instantly play any video & audio files and share them with friends and family effortlessly. In corporations, people at branch offices, telecommuters, and people who are traveling may need remotely access to the corporation's work. Remote video streaming is the ability to get access to a computer via internet from a remote distance, sending the media in a continuous stream of data and is played as it arrives. 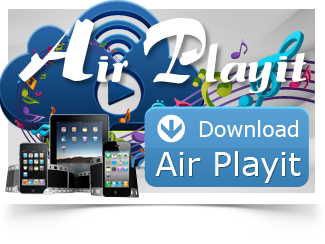 From now on, by using Air Playit, you will have access to a limitless number of movies and music at anywhere without waiting, and they take up no space on your devices at all. 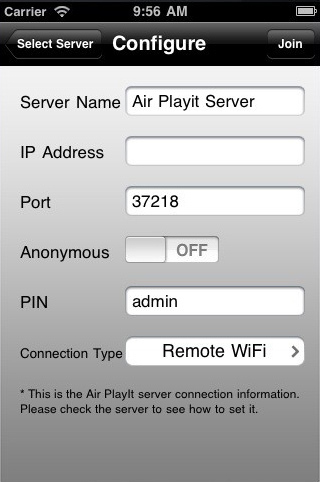 How to Use Air Playit for Remote Video Streaming The Air Playit works in two parts. A piece of server software sits on your desktop computer (both Windows and Mac OS are supported). The other component is an iPhone/iPad/iPod app that connects to the server and lets you browse and play video. Step two: Run the Air Playit App that has been installed on your iPhone iPad. To add a remote server, you should first make sure you know the pin and have access to the server. Then you need to fill the required information like IP address, Port, etc manually. After that, your Air Playit is configured for remote access. If you are still unable to connect to the server, then close the firewall for a try. Note that remote access needs an UPnP or NAT-PMP compliant router. If your router does not support this protocol you will have to configure the port forwarding yourself - forward the port 37218 from your router to the computer running Air Playit server. Step three: Browse the folders under the server, Click "Play" to watch video on iPhone iPad. Here we play AVI video which is not supported by portable devices, it will convert the video on the fly automatically, no need to wait before watching. For iPhone/iPad users, Air Playit gives seamless access to video and music collections stored on both owner's and friends' computers on the go, even miles away from where you live. It will be imperative to leverage the existing capability to enrich the entertainment.